Promagon is a versatile compound that will produce lean muscular gains and is suitable for cutting or bulking. 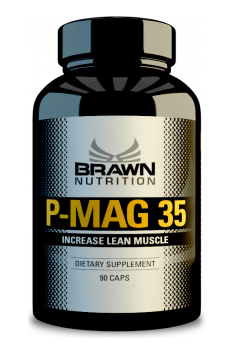 Brawn P-MAG 35 offers consistent gains, minimal side effects and “dry” gains that are relatively easy to maintain post cycle, subsequently it’s also a popular selection for beginners due to the reasons aforementioned above. P-Mag is a dry compound therefore should produce excellent lean body mass increases without any water weight or bloating. It’s also a great multi-purpose compound with many people using it for a wide variety of stages including cutting, bulking and recomping (gaining muscle, losing fat simultaneously), as always your diet will dictate your results. P-Mag can be stacked with other NON-Methylated compounds, it is critical that it not be stacked with another Methylated compound, doing so can put serious strain on your liver. Witam mam takie pytanie bo nic nie pisze że trzeba brać odblok? Bardzo dobry. Kolejny cykl i zapewne nie ostatni na tym środku. Siłowo porównywalny do dianabolu. Łagodny środek, ale koszulki w rozmiarze M stały się lekko za ciasne. Stosowałem 4 tygodnie 70mg/dzień. Zostało mi jeszcze 40 tabs, które zużyje w innym cyklu z innym środkiem. Z efektów ubocznych mogę wymienić skoki ciśnienia i bóle głowy wieczorem w pierwszym tygodniu cyklu. Ogólnie więcej siły na treningach, więcej serii, szybsza regeneracja. For optimal results, it's recommended to use 50-100 mg / day for a period of no longer than 6-8 weeks (commonly used for 5-6 weeks). Because of the long half-life it's advisable to take the largest portion in the morning. As with other methylated forms, it's recommended to use protective products for the liver and it's not recommended to combine the product with other methylated compounds. Due to the large masculinisation effect, the product should not be taken by women.